I just really love chai flavors. It’s probably one of the reasons why Indian cuisine is one of my favorites. And you know what I love more than chai? Chocolate!!!! Combining the two was really a no brainer. So here you are friends, my latest chocolate creation, just in time for Valentines Day. Because if you love yourself or someone else, you surely want whats best, and what is better than home made refined sugar free chocolate? I rarely turn down chocolate, even the higher quality store bought one with sugar in it, but if given the choice, I will always go for a home made nutritionally beneficial option. These little chocolates are so easy to make. I used silicone cupcake molds, but you could use actual chocolate molds, or even an ice cube tray. Just don’t fill that one up to the top unless you want a really thick chocolate! 2-3 TSBP thinly chopped candied ginger (optional, for a pure refined sugar free option) I have made these chocolates with freshly grated ginger and that was tasty also! depending on size of molds they can be done in a little as 30 minutes!!! It’s persimmon central at my house. I just can’t seem to ever buy enough at the farmers market, and just like bananas, when they start becoming too ripe to eat as is, there are so many fun recipes to create with them!! 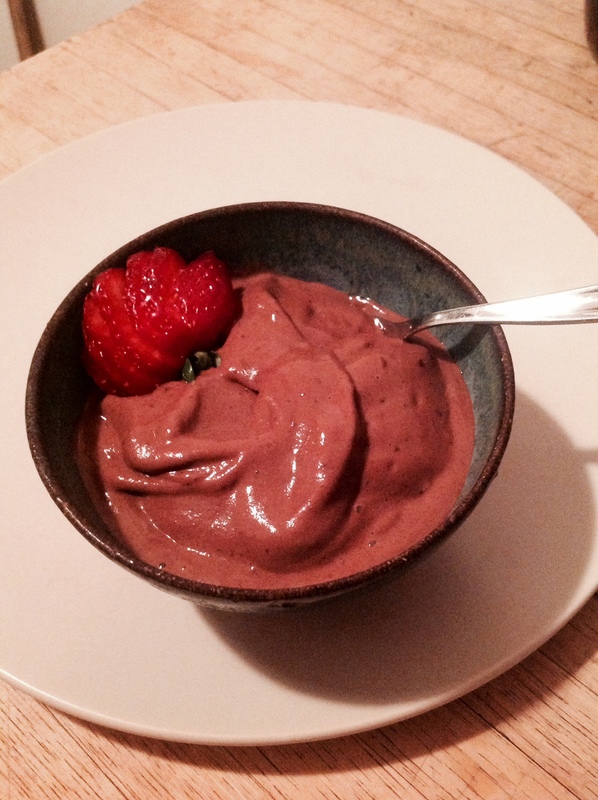 This pudding was so easy and quick to make. A few ingredients, a blast of the blender and some spoonfuls later you are on your way to gastronomy heaven. And then, to really bring this dessert over the top, I added a square of some divinely tasty and healing chocolate. A Purified Life makes beautiful artisanal chocolates infused with healing and medicinal mushrooms. If you need an extra reason to eat chocolate other than the fact that it’s amazing, has numerous health benefits and lots of nutrients (antioxidants, calcium, magnesium, to name a few), eat A Purified Life’s chocolates, because she brings it over the top with her masterfully blended ingredients in order to provide us with the most satisfying cacao experience while healing our bodies at the same time. While you wait for your chocolate order to ship, you should still whip up this pudding, add your own chocolate or eat it without. give a kiss to who ever you sharing this with and enjoy!! Just as the title states, luxurious, hint of chocolate, creamy and decadent, this beverage is a weekend treat. After making my Black Tea Mocha a few months back, I knew I was on to something with replacing coffee for tea in all the specialty coffee drinks. I like coffee, but I prefer tea. My warm beverage drinking world has opened up even wider! And lastly let’s not forget about what makes this drink so luscious: coconut butter. That’s right. 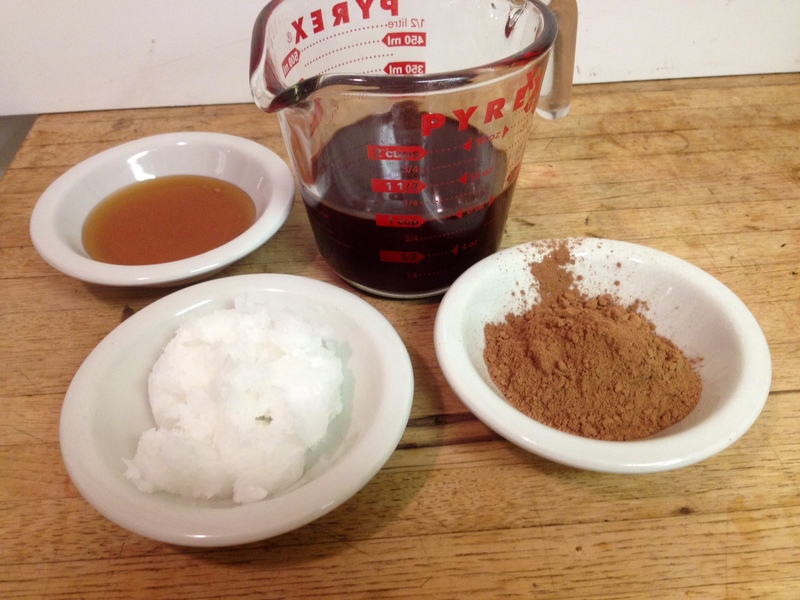 I’ve been using coconut butter in drinks for a while now to add healthy fats and decadence. A winner every single time. I like to use chocolate in a lot of things. And although I do buy dark chocolate chips, sometimes grain sweetened chocolate chips, for baking, I prefer to use my own if I have some. I try to keep some of my home made stuff handy for ice creams, raw desserts, granola bars, smoothies, etc… I like doing this, not only because it is cheaper, but also because it is refined sugar free and I can choose how dark or fruity or nutty, i want the chocolate to be. Here is a very simple recipe that I tweak every now and then depending on what I am going for. Happy Valentines Day!!! This treat is more delicious than the title suggests. “More” because it is soooo creamy and dreamy that you wouldn’t guess it’s vegan. 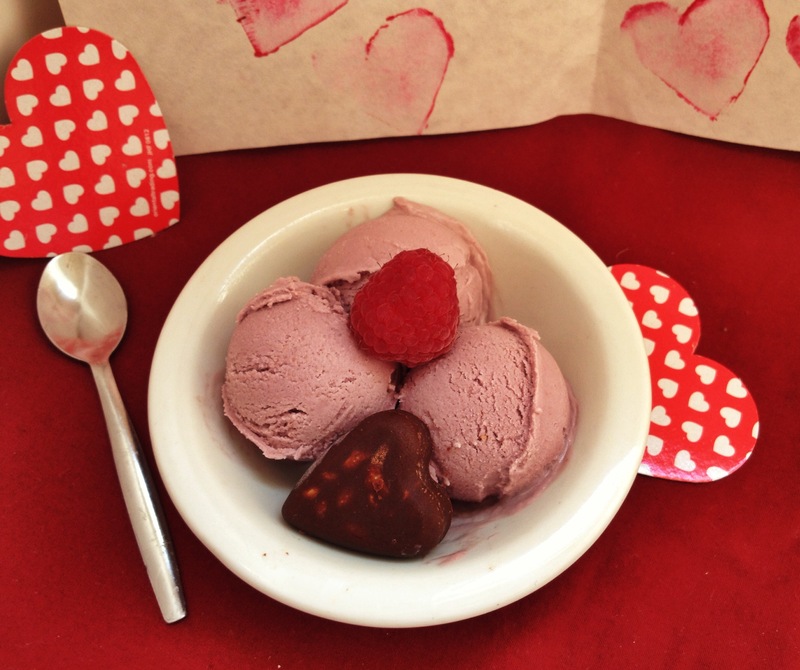 I bought some out of season, over priced, still pretty tasty, raspberries earlier this week because I really wanted to make this Valentines Day treat for my kids. Every now and then I go out of my habitual seasonal produce shopping because what I have in mind sounds so delicious that I must make it, like really soon. And I am so glad I did not wait for spring to make this!! This is so tasty that you don’t have to make it into ice cream! You can just eat it straight out of the blender as a yogurt substitute! While waiting for ice cream, make your chocolate hearts. 2 TBS honey or other liquid sweetener (adjust according to desired sweetness). in a saucepan, put the coconut oil and barely heat it up. Just enough to get it to starts melting. Turn off the heat and add all ingredients except for honey. As usual, it’s hard for me to stick entirely to a recipe, no matter how great it originally is 😉 I barely tweaked this one, mainly because of what I had on hand but also because it called for twice the sweetener that I chose to put in. If you have all the ingredients, this is so easy to make for full fudgey chocolate satisfaction. Last night I was craving chocolate. As a chocoholic, that’s most nights for me 🙂 And as a true chocoholic I wanted my fix quickly. This pudding is SO quick if you have all the ingredients on hand. Which I did 🙂 It takes less than 8 minutes to make. Whaaa?!?! What I love about this other than the rapidity of it, is that it completely changes consistency after letting it sit in the fridge for a couple hours(if it makes it that long). 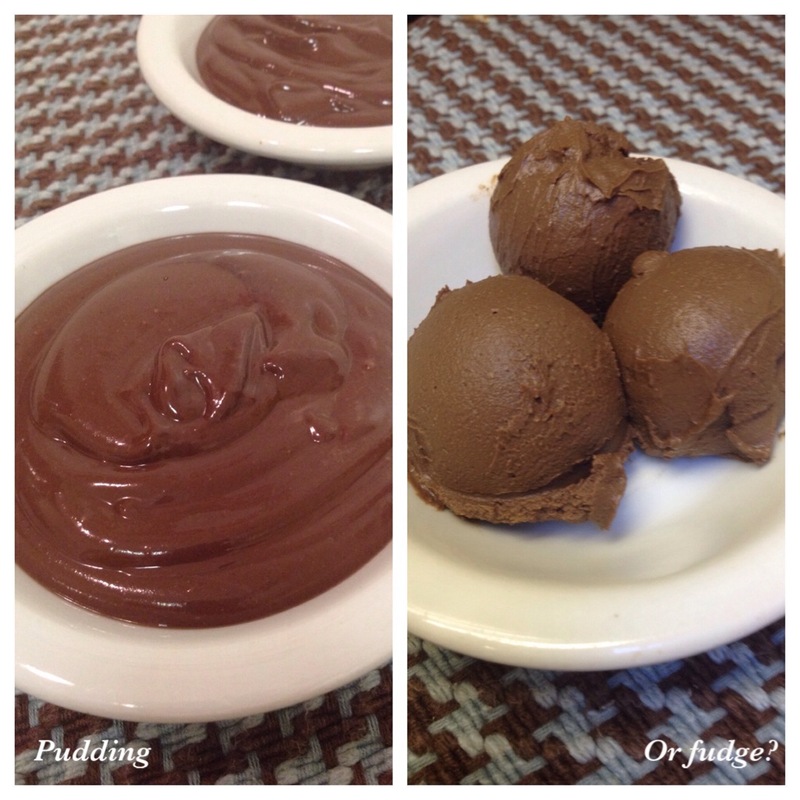 I get smooth silky pudding right off the bat, and then something more fudgey like….. It becomes thick and rich and just so yummy. Oh and yes, in true Pamplemousse style, it is under my standards of healthy. you got yourself a treat!!! 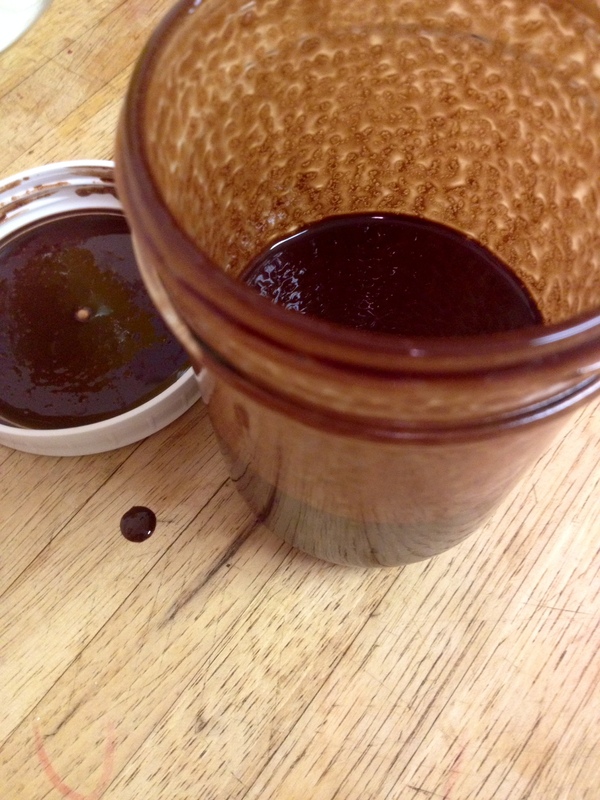 This is my basic raw chocolate sauce that I use for so many chocolate treats in my house. I build off of this to create all kinds of delightful satisfying temptations. I need to share it with you guys as I will be referring to it quite a bit in this blog. 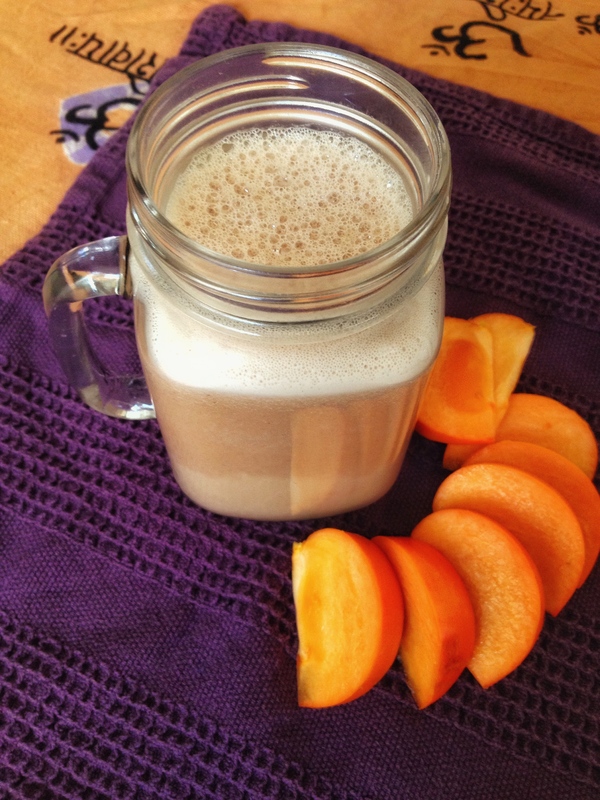 I have used a version of it in my banana ice cream as well as in my raw persimmon pie. So stay on the lookout for more yumminess to come here!! 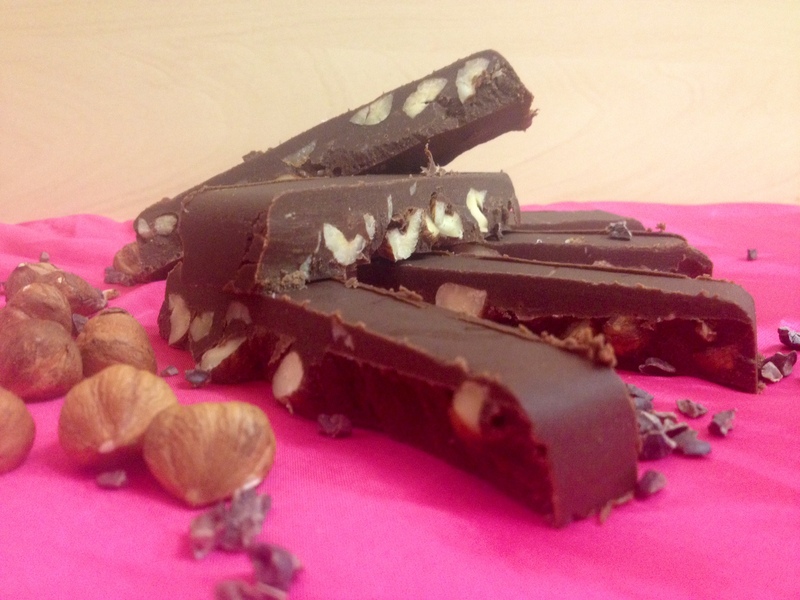 As the name indicates, this is a basic, simple healthy chocolate option. 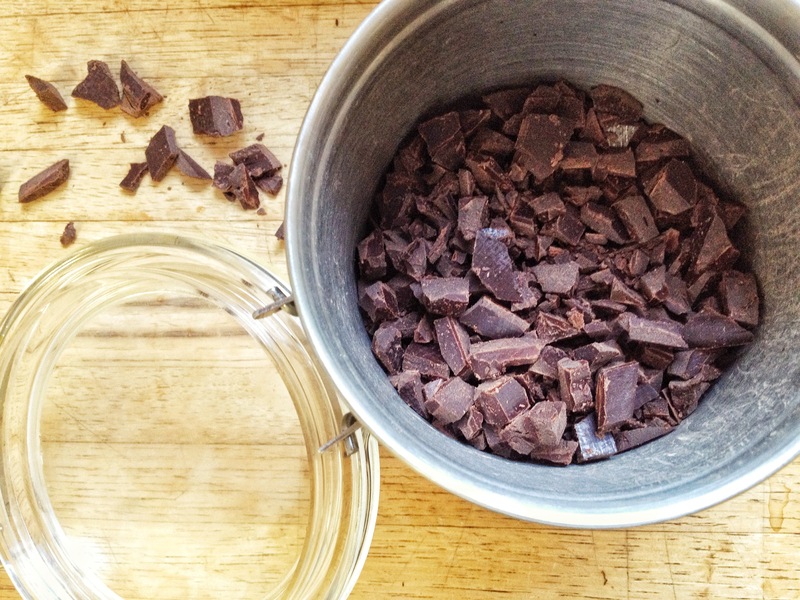 Three ingredients and just minutes away from mouth watering bliss (if you are a chocoholic like I am, this is key). in a double boiler melt all the ingredients (you can do this in a pot on the stove top, just make sure to have it on very low heat and turn off the heat before all the oil is melted, and finish melting by whisking). if in a jar, shake it vigorously every 5 minutes until it has come to room temperature, the sauce will become thicker. if in a bowl, just whisk it until it has come to room temperature. This last step is very important as it will allow for all the ingredients to cool while blending together. If you do not do this the oil and honey will separate, creating a very sweet bottom layer and a very oily dark chocolate upper layer when it cools completely. This is especially important when making raw chocolate in the freezer. I have made raw chocolates without blending all the ingredients together and the honey layer was all gooey and stuck to the bottom of the mold while the top was super dark in chocolate flavor. It wasn’t bad at all mind you!! Just not a nice chocolate that I could easily pop out. I’ve been on a muffin mission lately. I find it to be such a convenient food to have around with kids. I try and make my muffins nutritious so that they are not just a filler food and so I feel good about the fact that the kids want to eat 3 or 4 at once (I always make mini muffins now). 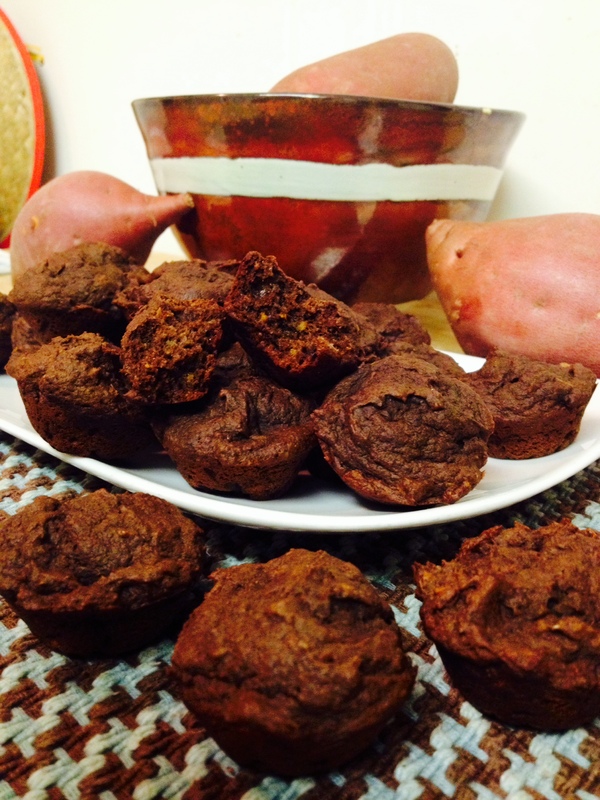 I had sweet potato left over from dinner last night, which makes a perfect base for a muffin recipe. I have made these before, but have altered the recipe a bit. And since I have a hard time following recipes in general, I will probably alter it again next time I make these 🙂 These muffins are a bit dense because of the sweet potato and the dates, but I find that to be a good thing so you can get full after only eating a couple. In my opinion, that’s what nutritious foods do: the high quality of nutrients make you feel full faster and longer than something less nutritious like pretzels, crackers or chips. I also intentionally never make my muffins overly sweet. If you like things super sweet, I recommend you add extra maple syrup. As usual I made a big batch and will freeze a couple bags in order to have some handy for when we need a quick snack or for school lunch. I love chocolate and I love sweets. I also love having a treat at night once all the kids are in bed 🙂 But I also love my body and my health so I must be choosy of what I put in my body and how often. This one came together because I really wanted something quick and easy and I was really in the mood for soft serve This treat is just that! I think it took me under 3 minutes to put this together. And it hit all the right spots for me: it’s sweet, it’s chocolatey, it’s quick, it’s healthy, it’s creamy, it’s cold. It’s YUM!!! !